From first time director Maria de Medeiros Capitaes de Abril (aka Captains of April, Capitaines d’Avril ) is the story of the 1974 coup that overthrew the 40-year fascist dictatorship of Portugal. The story is told through the eyes of two young captains whose stories are pivotal to events. The film basically concentrates on a handful of characters including the two young captains Maia (Stefano Accorsi) and Manuel (Frederic Pierrot) who return from military service in Africa with the pact that they will never kill again. Major Gervasio (Joaquim de Almeida) who’s amused by the coup more than anything else goes along for the entertainment value. 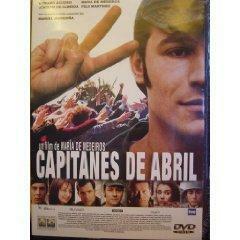 The film follows Maia as he marches through Portugal with other soldiers and Manuel as he commandeers a radio station. Several scenes depict Maia’s influence on events–particularly the use of nonviolence in the coup (the PIDE did fire on and kill protestors). Manuel’s alienated wife Antonia (Maria de Medeiros) is oblivious to her husband’s involvement in the coup as she tries to extricate her left-wing lover from prison, torture, and the dreaded PIDE (Secret Police). When Prime Minister Caetano finally surrenders, Maia “hands over” control to General Spinola (aka the Butcher), and Spinola refuses to negotiate with anyone beneath the rank of major. This scene shows how the old hierarchies remain, and while Portugal’s unpopular and expensive colonialization in Africa will end, the social order remains more or less the same. Capitaes de Abril is vague on some issues, and concentrates on the Carnation Revolution by focusing on the actions of Maia and Manuel rather than trying to portray the strategy of the coup, those behind the Armed Forces Movement (MFA) or social conditions beforehand. The film does however make it clear that the Portuguese colonial war between Portugal’s military and various nationalist movements in African colonies was very unpopular and largely responsible for the Captains’ Movement and Carnation Revolution. The beginning of the film includes many black and white photos depicting the victims of Portugal’s attempts to squash African liberation groups. Almost half of Portugal’s annual budget went to fund the war in its Portuguese colonies, and Portugal suffered from astronomical inflation at the time–another contributing factor to the war’s unpopularity at home. And naturally since no one in their right minds wanted to volunteer to participate in these genocidal actions, conscription was enforced for up to four years, and conscripts could expect the most appalling conditions in Africa. The war’s unpopularity at home is largely manifested in the film through the marriages and relationships of those forced to serve. Antonia, for example, feels that she and her husband became estranged thanks to his service in the Portuguese African Colonies, and the film makes a passing reference to Manuel’s diary in which he apparently mentioned that he had a relationship with an African woman. By the end of the film, the focus shifts to Antonia’s daughter and then the final scenes are played through her eyes.